If I walk into a photography shop nowadays and go to the digital accessory corner where the memory cards are found, it is clear that the industry, developing memory cards, has consistently been on the go without a standstill. For example; let's take a look at a manufacturer like SanDisk, developer of the flash storage products and the world's leading memory card supplier. During my meetings with SanDisk I've come to realise that the potential of the memory card has not fully shown yet, let alone that its potency has sunk in. Over the past few years the size of a memory card has reduced and at the same time the storage capacity and read and write speed has increased tremendously. 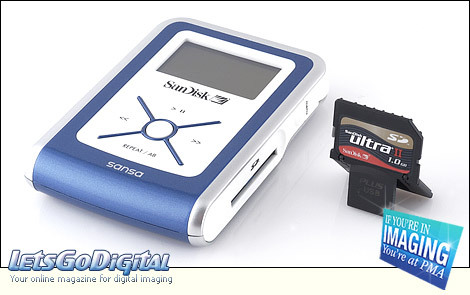 Currently a new innovation was introduced, a memory card with a built-in USB interface, named the SanDisk Ultra II SD Plus memory card. So it's time to take a closer look at this seemingly standard memory card and shed light on the benefits this card offers. SanDisk Secure Digital Plus - The benefits of the SanDisk Ultra II Plus were demonstrated during one of my meetings with Tanya Chuang, SanDisk's retail product marketing manager. The card is based on the Secure Digital format, the memory card that may be referred to as the standard storage medium by now. 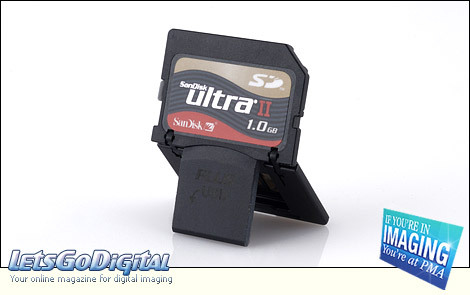 At the time only a handful digital cameras and some PDAs supported the new format, where as presently the majority of the digital cameras support the Secure Digital memory card. Besides that, the amount of camcorders, MP3 players and cellphones containing a Secure Digital slot, increases by the day. Every single one of these devices stores data on the card, but direct transfer from computers and digital cameras or MP3 Players is not possible. Earlier a physical connection between both devices or a card reader had to be used in order to enable data transfer. 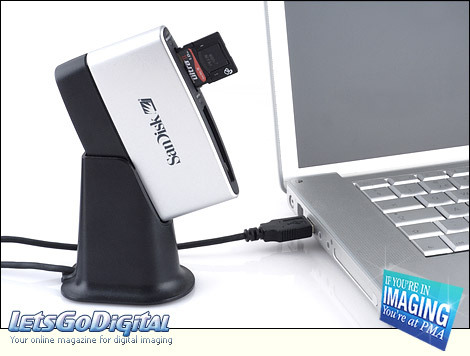 The SanDisk Plus puts an end to this by integrating a USB interface in the memory card. SanDisk SD Plus Ultra II familiy - The SanDisk SD Plus card stems from the Ultra II family where it gets its average speed of 9MB write and 10MB/sec read speed from. This speed is fast enough for the regular camera to be able processing the data quickly. The integrated USB interface (USB Hi-speed) is applied for the first time in the SanDisk Ultra II Plus card, but I can imagine the concept being extended to other format memory cards. 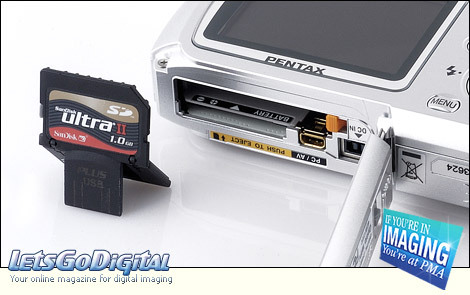 During digital camera testing I use the SanDisk SD Plus card on a regular base. The convenience the USB interface offers is tremendous and for me it means gaining in speed, ease and of course I have to carry one cable less. It seems so simple but it's so very functional, this SD Plus concept. If you bend the SD plus card for the first time, and look in surprise at the freed USB interface, you will immediately recognize the advantages of such a card. For example, imagine you're on the road, with your notebook, a tool that is used mobile more and more, and you're also equipped with your camera. You take a few shots, remove the SD Plus card, insert it in a free USB port of the notebook and you will have immediate access to the files, this is simply ideal! SanDisk Secure Digital format - The Secure Digital memory card is used as storage medium in digital compact cameras, and besides that in the digital reflex; entry-level models as well as professionals are embracing the tiny card. The SanDisk Ultra II Plus memory card features, folded out, the same dimensions as a standard SD card and certainly fits in every SD memory card slot. It's not before removing the SD card that its unique features are revealed. "Breaking" the card in two frees a USB interface. 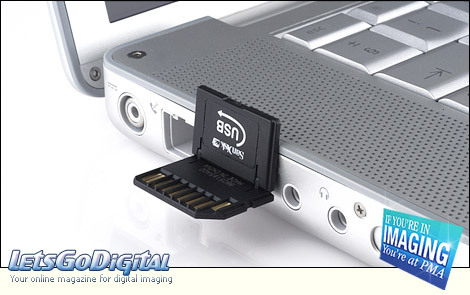 Inserting the card in a free USB port, offers the user direct access to the stored data. Moreover the card can also be used as a USB flash drive, this is very functional! In practise no difference appeared in speed when reading or writing of data was carried out by a card reader or directly through the USB port. SanDisk Ultra II Plus - Reduced Size MMC Card - The format of the SanDisk Ultra II Plus card in fact equals that of the SD card, however the type of memory applied in the SD card is the so-called Reduced Size MMC Card. This becomes clear when the card is bent to free the USB interface and the memory with it. It's an ingenious amalgamation of two different form factors. And very functional in practise. If I use a digital camera and quickly want to transfer a number of photos to my notebook, it can be realised quickly and simply without the need for a card reader or cables. Travelling to various press meetings and events like the PMA 2006, which by the way is coming up soon, I like to listen to music from my MP3 Player and it happens frequently that I like to extend the number of songs via my notebook. Now it's just a matter of inserting the SD Plus card in a free USB slot, transferring the songs, removing the card and listening to it directly. No cables or clumsy PCMCIA cards, in stead just direct access which only requires a tiny action. Editor's comment: "SanDisk is the founder of the current flash memory card. The memory card assortment has increased tremendously over the past few years. Besides the addition of different types, speeds and storage capacities, innovations like the SanDisk Plus concept is one of the ingenuous novelties that gives the memory card even more potency. The idea is strong, the application in practise very convincing and what's more it is very user-friendly. I can really imagine this concept being further developed and that in the near future we will be welcoming the next generation SanDisk Plus memory cards in different flash format. As far as I'm concerned, the concept is absolutely a great success!"